Some things are just not meant to be. I set off, already late, to visit Eltham Palace. Once the home of the Courtaulds this famous Art Deco house is now in the capable hands of English Heritage. Within spitting distance of my destination a rear tyre blew out, resulting in very long journey down to the coast in a very hot pick up truck! Now I expect to be car-less until Wednesday – great for the environment, not so good for taking the rubbish to the tip for recycling. The garden had not been watered since Wednesday and consequently I was greeted by a lot of tired, thirsty looking plants, begging for a good soak. The only real casualty was an indoor plant which had not survived the sauna-like temperatures on its sunny windowsill. Apart from that, everything else will live, but it’s an interesting reminder of which plants can really take the strain when it comes to water deprivation. I tend to think many have grown a bit too soft and moisture dependent this year because of all the rain and are a more than usually shocked by the mini heatwave. 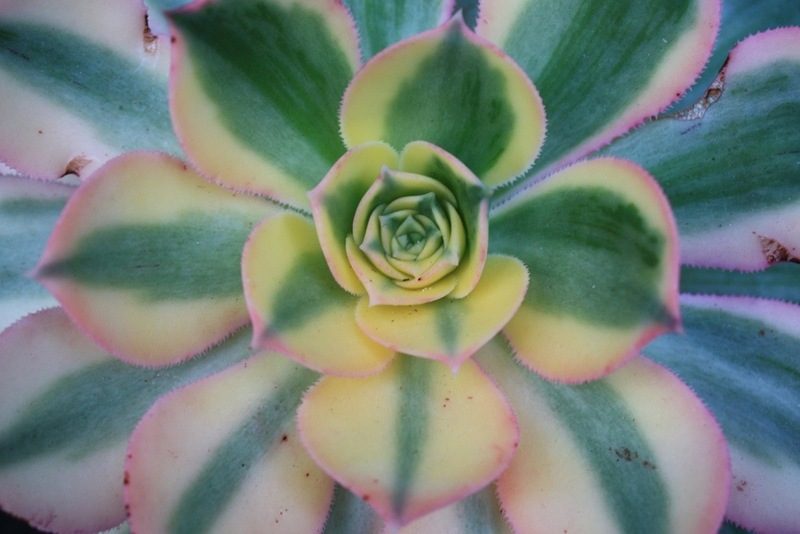 Of course succulents such as Aloe striatula and Aeonium are completely unphased. 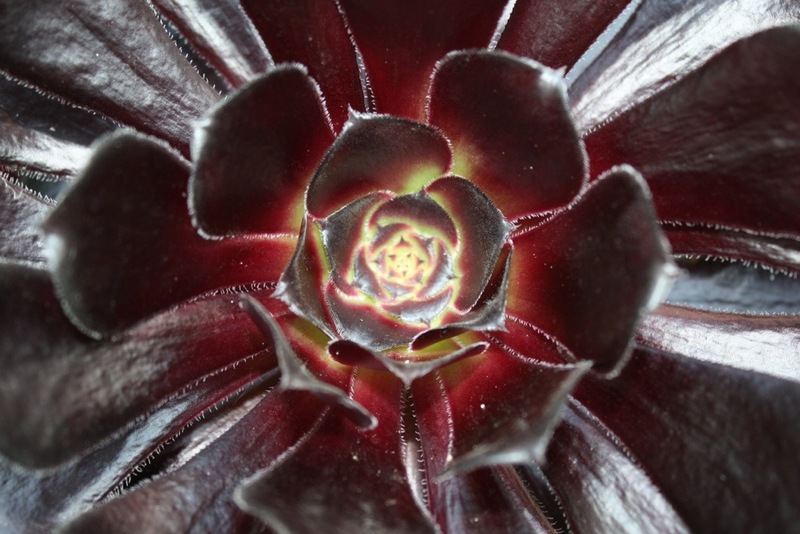 (Top, Aeonium arboreum “Schwartzkopf”; above Aeonium decorum “Sunburst”, in all its fabulous coconut ice shades.) The trees, which after 5 years have their roots down nice and deep are also still luxuriant. 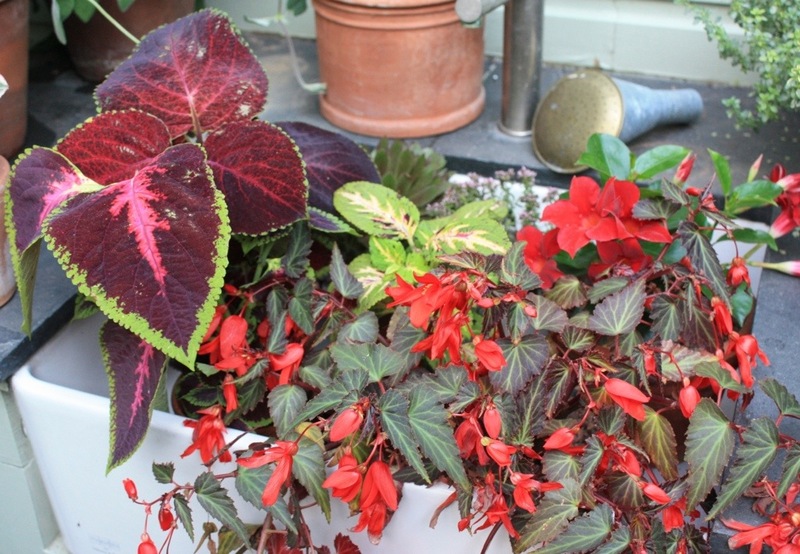 However the gingers, Begonias and Fuchsias had lost the sheen to their leaves and looked decidedly under the weather. Wisterias can tolerate drought when established, but my newly planted specimen definitely could not stand the heat. After a good drench it is now picking up again. I was surprised to find Verbena bonariensis also looking sad, but not so Zantedeschia aethiopica which can be grown as a marginal water plant so dislikes very dry spells and was sick as a parrot. 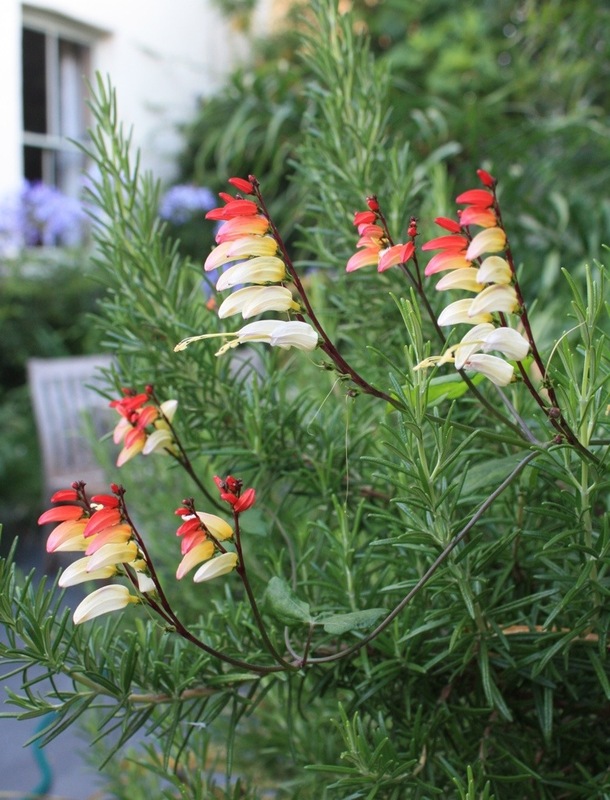 Below, Mina lobata sends fiery sparks through a tough but unruly rosemary bush. Like frost hardiness, drought tolerance can depend on many factors. Generally the longer a plant is established the better its chances are of surviving a period without water. Some plants simply wilt as a defence mechanism and will perk up again over night. However it’s never a good idea to let container plants dry out – they can be hard to re-wet and growth can be checked. In some plants such as Agapanthus and Camellias drought can prevent the following year’s flower buds forming and you reap the consequences later on. If smaller pots get dry the best thing to do is place them in a sink or bucket of water up to about 3/4 the height of the compost. Let them have a really good drink (preferably out of direct sunshine) and then take them out and let them drain. If they are going to survive they should perk up pretty quickly, but it’s amazing what can be bought back from the brink with a little bit of TLC. Below, today’s drought victims enjoy a refreshing bath ….. my turn next!